…are routins of behaviour, and repeated regularly through previous repetition of experience. Old habits are hard to break and new habits are to use, because this is a slow process when need change our thought and action, the habit is the particular manner what we learned and represented in memory. 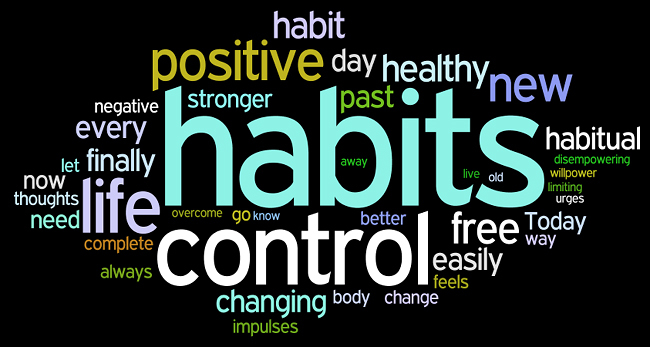 Habits can give benefit or pain for you. Our routins came from our past, what is it our experience, if you not happy – you can change that. Your daily routines can make your life better, healthier, happier and full of energy. You have to know what is it working for you and what is doesn’t. When you start change something in your life, please start with one = 1 thing a time, need your decision perseverance, discipline and control again and again until you succeeded. Your toleration is important, because when we try new thing everything turn up from our experience, then when everything under your controll make easier. You can do that, if you want to and working on it. This entry was posted in Nature and tagged difference, feeling, happy, life, present, Time by Susanna. Bookmark the permalink.